The Apple Park Campus is a circular shaped building with four storeys above ground. Image courtesy of Cupertino Council. Construction of the facility began in 2013. Image courtesy of Cupertino Council. Apple Park Campus appears as a giant spaceship. Image courtesy of Cupertino Council. Landscaping at the site was increased from 20% to 80%. Image courtesy of Cupertino Council. The building has a courtyard at the centre. Image courtesy of Cupertino Council. Approximately 2,200 trees were planted as part of the sustainable landscaping. Image courtesy of Cupertino Council. The world’s largest technology company Apple constructed a new office building in its campus in the city of Cupertino, Santa Clara County, California, US. Known as Apple Park (Apple 2), the campus is the second headquarters of the company. Apple has been present in Cupertino since 2006. The company purchased a 98-acre property along Pruneridge Avenue near I-280 from Hewlett Packard (HP) in November 2010 to construct the Apple Park Campus and became the largest landholder in Cupertino. The new headquarters is located adjacent to the company’s current headquarters building in One Infinite Loop. The Apple Park campus is designed by Foster + Partners and is inspired from Masdar in Abu Dhabi. The building has an area of approximately 2.8 million square feet. 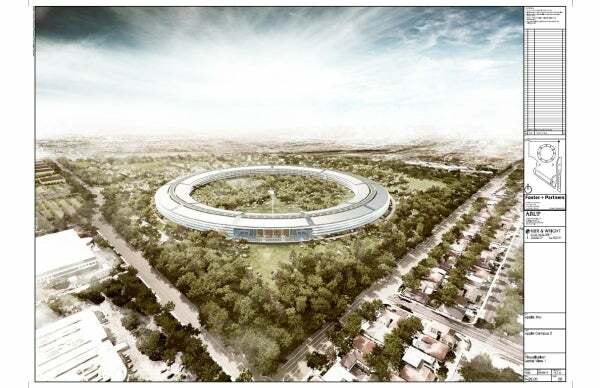 Late Apple CEO Steve Jobs presented design plans for the new headquarters to the Cupertino City Council in June 2011. The council approved the Apple Park project in November 2013. Construction began towards the end of 2013 and was completed in 2017. The Apple Park office campus is a single circular shaped building with four storeys above the ground and two basement levels. It has the shape of a hoop and the appearance of a giant spaceship. The building also has a courtyard at the centre with open green spaces for employees. The circular campus plays a vital role in providing security over the perimeter and easing internal circulations to the employees. The design included large curved architectural pieces of glass. The interior of the circular building is divided into eight sections by tree-lined walkways. The walkways randomly surround the entire building. The project is an integrated design and environmentally friendly development and exceeds social and economic sustainability goals. The current Apple headquarters building accommodates approximately 2,600 employees and is connected to the new campus by an underground tunnel. The new facility also has its own transit centre inside the secured perimeter. The Apple Park Campus is designed to accommodate approximately 13,000 employees. It features research and development facilities, office space, a 1,000 seat auditorium in a 100,000ft2 area, a 25,000ft2 corporate fitness centre and a 3,000 seat café. It also has a circular park at the centre of the building. Two additional buildings were built east of North Tantau Avenue on the campus. With a total area of 300,000ft2, these buildings accommodate additional technical support functions to support the main building. A four-storey subterranean parking structure was also part of the Campus construction. There are approximately 11,000 parking spaces, including those in the basement level parking of the main building. The landscaping of the new campus site was increased from 20% to 80%. The number of trees also increased from 3,700 to 6,000. The plantations include apricot orchards. Surface parking was decreased from the 9,800 to 1,200 (90% underground) to facilitate the landscaping. The landscaping of the 150-acre campus was handled by a Stanford University arborist. Foster + Partners collaborated with the San Francisco office of Arup North America for designing the Apple Campus Park. Local civil engineering firm Kier & Wright Civil Engineers & Surveyors was the planning consultant. The firm was also responsible for the construction of the current headquarters building for Apple. The development incorporates strategies to reduce water and energy consumption. The campus generates most of its electricity requirements through an on-site natural gas-powered central power plant. The power plant is a 75,000ft2 single-storey structure situated along the 280 Freeway. It reduces the dependence on the city’s electric grid. The employees travel by the company buses which run on bio-fuel. The overall footprint of the buildings at the site is reduced from the existing 1.4 million to one million (30% reduction). Taipei 101, formerly known as the Taipei World Financial Centre, is a 106-storey building located in the Xinyi District of Taipei in Taiwan. Siemens has started construction of its new global headquarters in Munich, Germany, in 2013.